LUCENA CITY - Leaders of pro-environment groups on Monday held a protest rally during the regular session of Quezon provincial legislative board condemning its recent approval on various proposed projects of San Miguel Corporation in Sariaya and Pagbilao, Quezon. The rallyists, led by Rev. Fr. 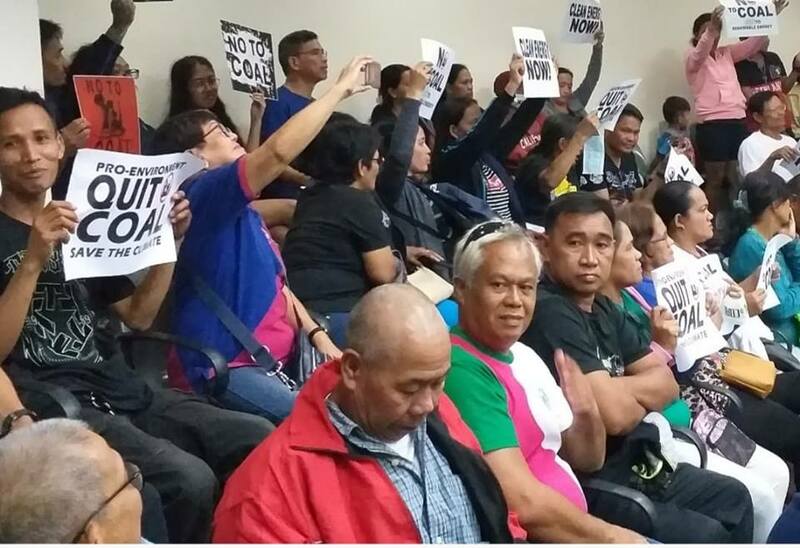 Warren Puno, Ministry of Ecology director of the Diocese of Lucena have expressed their strong opposition to the multi- million proposed projects that include another coal-fired power plant. Based on the resolution authored by Board Member Ferdinand Talabong which was hastily approved by the board, the proposed projects to be built in Sariaya are feedmill and cement grinding plant, port facilities and a tank farm, among others. Among the planned projects in Pagbilao are the 1, 200 megawatt coal- fired power plant, 2- million tons per year cement plant, sea port, dressing plant, slaughter house, ready-to-eat plant, logisticsqq center and quarry site. When allowed by board presiding officer, Vice- Governor Samuel Nantes to speak, Puno started his piece by saying that they are not against progress and development as long as the environment and the people will not be adversely affected. “Una, kami po ay hindi tumututol sa mga proyektong pangkaunlaran maliban kung ito ay magdudulot ng masamang epekto sa kalikasan at sa mamamayan”, said the priest. “We just want to clarify some important points. Firstly, have you made a study on the proposed project? If so, have you shared this to the concerned residents? Have you initiated consultations to them?And lastly, how true is the information that each board member was given grease money of P1 Million to P2 Million by the San Miguel Corporation”, he added. Majority floor leader Sonny Ubana who spoked on behalf of the board quickly defended the chamber and answered the questions point by point. Ubana disclosed that they attended a technical presentation of the projects on invitations of SMC in Makati City on December 14, three days before they finally passed the resolution approving the resolution on December 17. Ubana said it is the regulatory bodies which are responsible to conduct a study, and public consultations, referring to the local government units and the Department of Environment and Natural Resources (DENR) which issue business permits and Environmental Compliance Certificate, respectively. He said the board’s approval of the resolution was all done above board and in the right process. Ubana vehemently denied the allegations that each of them had received P1 Million to P2 Million from the project proponent. It was learned that the board had received a letter on November 23, 2018 from Quezon Governor David Suarez asking for the passage of a resolution approving the proposed projects of SMC. The board hastily approved it in the midst of Christmas season on December 17.